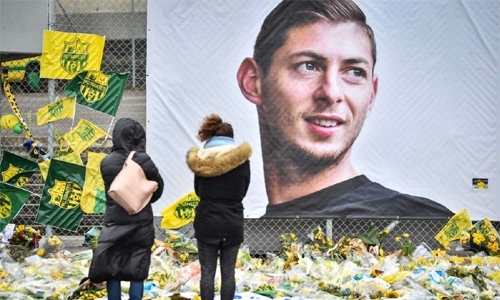 Argentine foot baller Emiliano Sala died of “head and trunk injuries”, an inquest in England heard yesterday as it began to examine his death in a plane crash in the sea. Sala, 28, had signed for English Premier League side Cardiff City and was flying to his new team from his old club Nantes in France when his plane went missing over the Channel on January 21. The wreckage was located on the seabed. The striker’s body was recovered but pilot David Ibbotson is still missing. The plane remains under the sea. In a brief hearing in Bournemouth on the south coast, an inquest into Sala’s death was opened, and adjourned until November 6 pending further inquiries. The post-mortem presented at the hearing gave Sala’s cause of death as “head and trunk injuries”. Sala was formally identified by fingerprints. In English law, inquests are held to examine sudden or unexplained deaths. They set out to determine the identity of the deceased, the place and time of death as well as how the deceased came by their death, but they do not apportion blame. Senior coroner’s officer Ian Parry told the hearing that the plane “was located on the seabed in international waters. “Following a closer examination of the site a body, later identified as Mr Sala, was found and recovered. “To date the pilot, Mr Ibbotson, has not been found. “Police, the Air Accidents Investigation Branch and the Civil Aviation Authority are continuing with their inquiries,” he said. A fundraising campaign to restart the search for Ibbotson is already more than half way to its £300,000 ($385,000, 340,000 euro) target. “If you’ve got hope then you shouldn’t give up,” his daughter Danielle told ITV television. “He wouldn’t stop searching for me.” Nantes gave a final rousing send off to Sala with a series of moving gestures in their Ligue 1 match against Nimes on Sunday. Known as the Canaries due to their yellow kit, Nantes played in a one-off full black outfit with Sala’s name on the back of each shirt. Tickets for the game were sold at a symbolic nine euros ($10) in memory of the player’s shirt number, which they have also withdrawn. Before Saturday’s Premier League match between Southampton and visitors Cardiff, a minute’s silence was observed.